As scientists ready for the launch of the MAVEN orbiter, a newly released ScienceCast video ponders the question, What Happened to Mars? Billions of years ago when the planets of our solar system were still young, Mars was a very different world. Liquid water flowed in long rivers that emptied into lakes and shallow seas. A thick atmosphere blanketed the planet and kept it warm. In this cozy environment, living microbes might have found a home, starting Mars down the path toward becoming a second life-filled planet next door to our own. Today, Mars is bitter cold and desiccated. The planet’s thin, wispy atmosphere provides scant cover for a surface marked by dry riverbeds and empty lakes. If Martian microbes still exist, they’re probably eking out a meager existence somewhere beneath the dusty Martian soil. What happened? This haunting question has long puzzled scientists. To find the answer, NASA is sending a new orbiter to Mars called MAVEN (Mars Atmosphere and Volatile Evolution). Mars was once on track to become a thriving Earth-like planet, yet today it is an apparently lifeless wasteland. A NASA spacecraft named MAVEN will soon journey to Mars to find out what went wrong on the Red Planet. “The goal of MAVEN is to figure out what processes were responsible for those changes in Martian climate,” says Bruce Jakosky, Principal Investigator for MAVEN at the University of Colorado at Boulder. 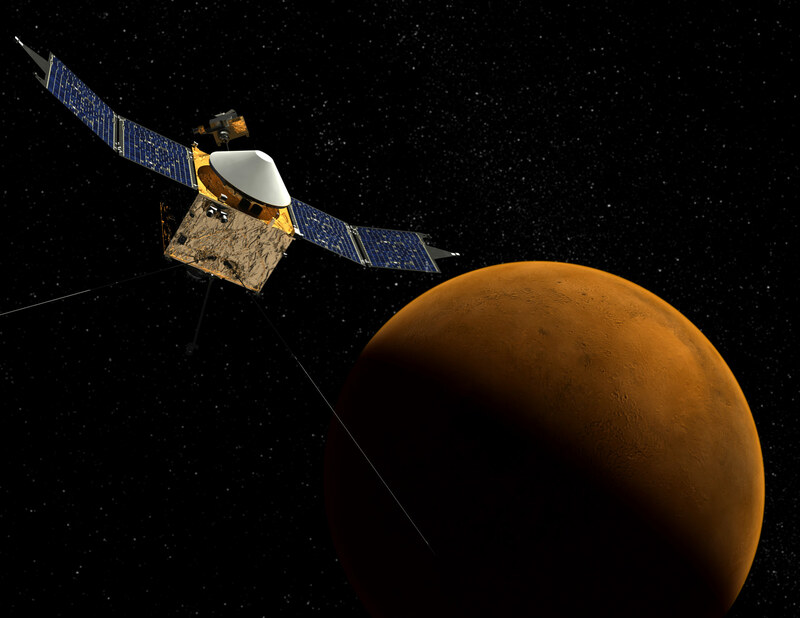 Scheduled for launch in Novomber 2013, and due to arrive in September 2014, MAVEN is bristling with instruments to study Mars’ upper atmosphere. That’s where many researchers believe the answer lies. The only way Mars could have been wet and warm 4 billion years ago, is if it also had a thick atmosphere. CO2 in the Martian atmosphere is a greenhouse gas, just as it is in our own atmosphere. A thick blanket of CO2 and other greenhouse gases would have provided the warmer temperatures and greater atmospheric pressure required to keep liquid water from freezing solid or boiling away. Something caused Mars to lose that blanket. One possibility is the solar wind. Unlike Earth, Mars is not protected by a global magnetic field. Instead, it has “magnetic umbrellas” scattered around the planet that shelter only part of the atmosphere. Erosion of exposed areas by solar wind might have slowly stripped the atmosphere away over billions of years. Recent measurements of isotopes in the Martian atmosphere by Mars rover Curiosity support this idea: light isotopes of hydrogen and argon are depleted compared to their heavier counterparts, suggesting that they have floated away into space. Scientists have also speculated that the planet’s surface might have absorbed the CO2 and locked it up in minerals such as carbonate. However, this theory has faded in recent years as Mars rovers and orbiters have failed to find enough carbonate to account for the missing gas. MAVEN will be the first mission to Mars specifically designed to help scientists understand the ongoing escape of CO2 and other gases into space. The probe will orbit Mars for at least one Earth-year. At the elliptical orbit’s low point, MAVEN will be 125 km above the surface; its high point will take it more than 6000 km out into space. MAVEN’s instruments will track ions and molecules in this broad cross-section of the Martian atmosphere, thoroughly documenting the flow of CO2 and other molecules into space for the first time. Once Jakosky and his colleagues know how quickly Mars is losing CO2 right now, they can extrapolate backward in time to estimate the total amount lost during the last four billion years. “MAVEN will determine if loss to space was the most important player in driving Martian climate change,” Jakosky says. In the grand scheme of the Solar System, Earth orbits alongside a world that began with as much promise for life as our own … yet turned out so differently. After all these years, MAVEN could write the final chapter in a haunting planetary mystery. 3 Comments on "New ScienceCast Video Explores the Mystery of Mars"
Perhaps the fact that Earth has locked in deep rocks like majorite hold sufficient water to fill the oceans many 10s of times over is the key. It appears pressure is the key to this band of deep water in rocks. Perhaps this band of pressurized rock is the result of a reversal of our sun. Perhaps our star Sol is a magnetar that throws off energetic magnetism in bands each reversal which is actually a tick down like an unwinding spring watch. As R Duncan proposes, a magnetar is short lived so the energy thrown off would rapidly drop. These pressure bands inside the Earth may be more than the one found at 250 to 500 miles deep in the Earth that holds deep water. The tapui of the Brazilian highlands are possibly located within an additional band of magnetism. Was this band originally lower? and stronger? And provided the rain veil of myth? Is the one at 250 to 500 m actually a result of a solar event which produced the Cambrian explosion of 600 my ago? Did Mars have one to? Has the magnetic aura of this event faded to the extent that Mars is exposed while Earth is not? yet? MAVEN explorer of NASA and MANGALYAN explorer of India aim both to study the outer atmosphere of Mars for its carbonaceous compounds which can tell tale of once life existing in Mars, when our Earth was very hot and formidable for living. Mars was just at the right temperature then for living bacteria to flourish. I have always been telling these in my articles that tomorrow when Sun cools further, earth would be icy and uninhabitable and the formation of life can take place in Venus next. It is not possible to dig Mars to sufficient depths to find any living bacteria in a hostile conditions or even there imprints on rocks. But studying the atmosphere for the signatures of life is a possible one. Thank You. It is simple logic that there was life on mars way before it formed on earth, and probably there is one single origin of life in this solar system, maybe on mars, since on earth conditions similar to mars were only few billions of years after. let s face it, in cosmic time, life on earth is but a minute if not less. We were never the first attempt of the universe to produce life, we re just an improved version of a canceled experiment. And allthough this is a theory is at least the same plausible as the one in this article.